Drescher drew inspiration from the work of Ball and her role in Here's Lucy while working on The Nanny. Admired by fans everywhere, these two comedic queens are joining forces for a very special night on COZI TV. 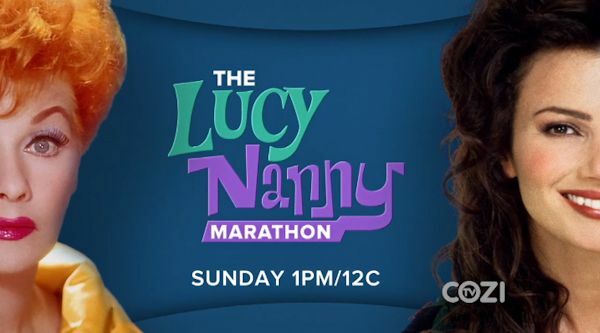 The marathon will feature fan-favorite episodes of Here's Lucy such as Lucy and Johnny Carson, where Lucy Carter sneaks her family into a live taping of The Tonight Show hosted by Johnny Carson, only to win an audience contest, and with it, a free dinner at the same restaurant as Carson himself. The marathon will also feature hit episodes of The Nanny like The Whine Cellar, an unforgettable episode where Fran finds herself trapped in a wine cellar while the rest of the family celebrates Fran's mother's 50th birthday upstairs. Freeform announced that production began on their third original holiday film, The Truth About Christmas, from MarVista Entertainment. The movie will premiere during Freeform's "25 Days of Christmas" annual programming event. The Truth About Christmas joins previously announced holiday originals Life Size 2, starring Tyra Banks and Francia Raisa, and No Sleep 'Til Christmas with Dave and Odette Annable. Kali Hawk (New Girl) stars as Jillian, a successful political consultant, confident in her ability to put a spin on anything whose next big project is the upcoming mayoral campaign for her boyfriend, George (Damon Dayoub, Freeform's Stitchers). On the way to meet George's family for the first time during the holidays, an unusual confrontation with a toy store Santa results in a drastic change in Jillian where she can't stop herself from wildly spilling the truth. Ali Ghandour (Freeform's Alone Together) costars as George’s brother Blake, who believes you should always be true to yourself but thinks Jillian just might be losing it. Jillian must find a way to make it stop before her holidays, her job and her relationship are ruined.